As smartphone cameras have become more powerful, it’s gotten a whole lot easier for a serious iPhone photographer to justify spending hundreds of dollars on accessory lenses, tripods, and gimbals designed to drag the best images and video possible out of their handsets. These extras don’t come cheap and their diminutive size makes them easy to lose. Stashing them in your backpack or camera bag makes them difficult to find or organize and eliminates the size savings that rolling through a photo shoot with nothing but a smartphone imparts. What’s needed is a bag designed specifically for smartphone photography. 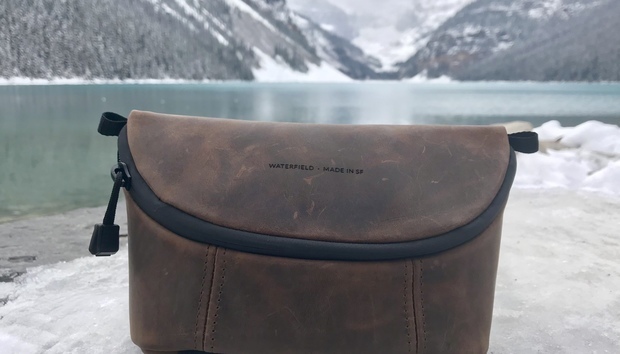 With their iPhone Camera Bag ($99 to $129 MSRP), Waterfield Designs has attempted to give us exactly that. Waterfield Designs called it an iPhone Camera Bag but, provided your handset’s no larger than an iPhone 8 Plus, you’ll be able to jam most any smartphone or action cam into it. The iPhone Camera Bag is just the right size for carrying a smartphone and a few photographic essentials. The bag comes in two different finishes: ballistic nylon and a high quality grizzled leather. Available for $99 and $129, respectively, neither iteration of the bag comes cheap. But given how much replacing a single lost or damaged lens from a company like Olloclip or Moment can set you back, it’s possible to look at the purchase price as more of an investment than a burden. Both versions of the bag are sized at 8 x 3 x 4 inches, and weigh less than 10 ounces. 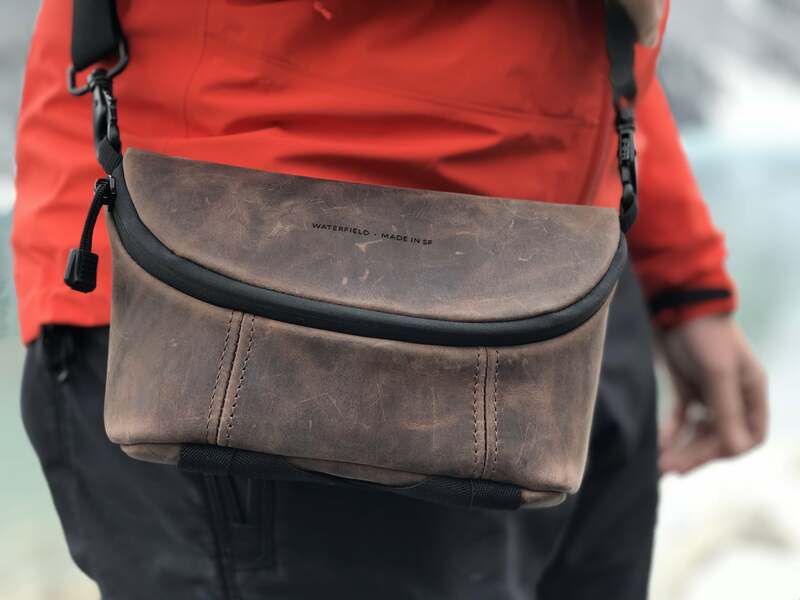 The leather and ballistic face fabrics of the bag are both weather-resistant and the main compartment’s waterproof zipper helps to keep dust and liquids at bay. The whole bag is swathed in a layer of dense foam, which is more than adequate for protecting any delicate hardware being carried inside of it from bangs, bumps, and other casual abuse. Further protection is found in the bag’s adjustable hook and loop dividers, which can divide and protect up to four lenses from banging up against each other while you’re on the go. The bag also has an internal zippered mesh pocket, perfect for stowing a few cables, lens filters, or a LensPen. Finding things inside of the iPhone Camera Bag would be easier were the interior a lighter color. When it’s time to whip out a lens or other accessory, the bag opens up wide, making it easy to access everything inside. 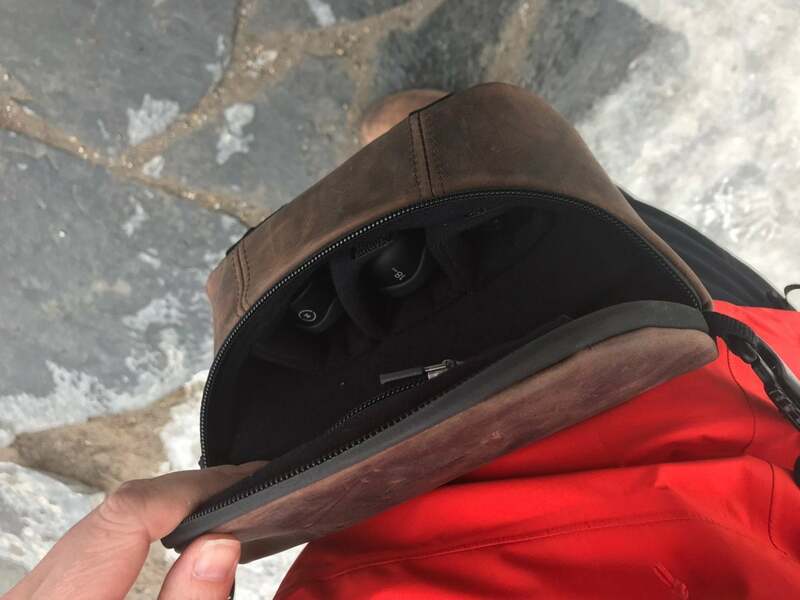 Unfortunately, the interior of the iPhone Camera Bag is black—I found that this made it difficult to quickly find what I was looking for, despite using its interior dividers to organize my gear ahead of time. Given that so much of good photography depends upon being able to quickly capture a moment using the right hardware, it’s a disappointing oversight. The iPhone Camera Bag comes with a thin, adjustable nylon strap. Were this any other bag, I might take issue with this: Thin straps tend to make for an uncomfortable carry. But this isn’t a pack designed to carry your lunch, laptop, and jacket. The size and weight of the gear you’ll want to carry in the bag will be minimal, so the strap’s width can be, too. We’d be happier with the iPhone Camera Bag if these fabric loops were as tough as the hooks that attach to it. Waterfield Designs equipped the strap with a pair of sturdy, spring loaded metal hooks that will ensure long service. Unfortunately, the clips attach to a pair of flimsy nylon loops on the side of the bag. I feel that these loops could easily succumb to wear over time. Replacing or repairing one could prove a major pain. 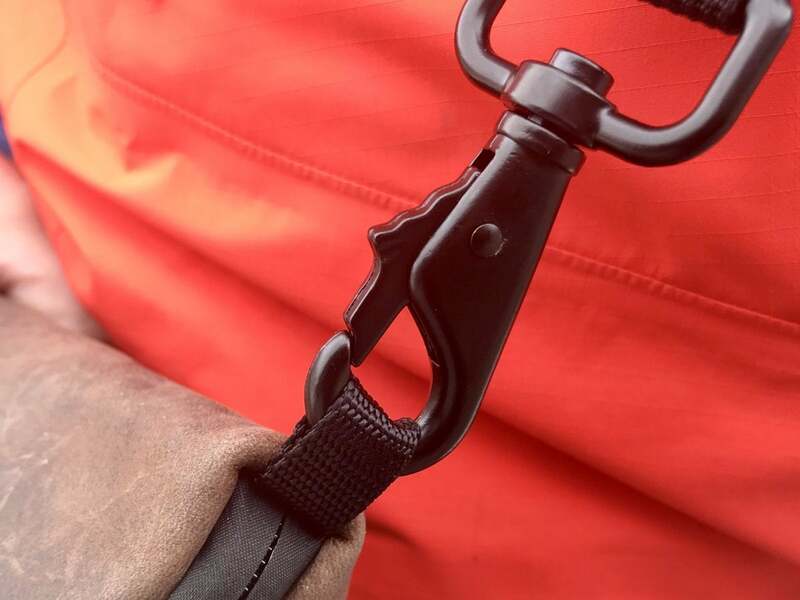 If you’re not into rocking it on a shoulder strap, it’s also possible to wear the bag on your belt, thanks to a pair of belt loops built into its backside. The loops could also be used to attach the camera bag to a backpack strap—a nice touch. I was also pleased by the fact that the bottom of the bag comes equipped with a number of elastic straps that can be used to securely lash a portable tripod or smartphone gimbal to. Waterfield Designs’ iPhone Camera Case provides some much-needed protection to expensive smartphone photography accessories. But its steep price and a number of design flaws make it difficult to recommend it without reservations. From CFO to CEO: Does Anaplan's new boss have a plan?